Back at it again with the popsicles! What is summer without refreshing popsicles??! 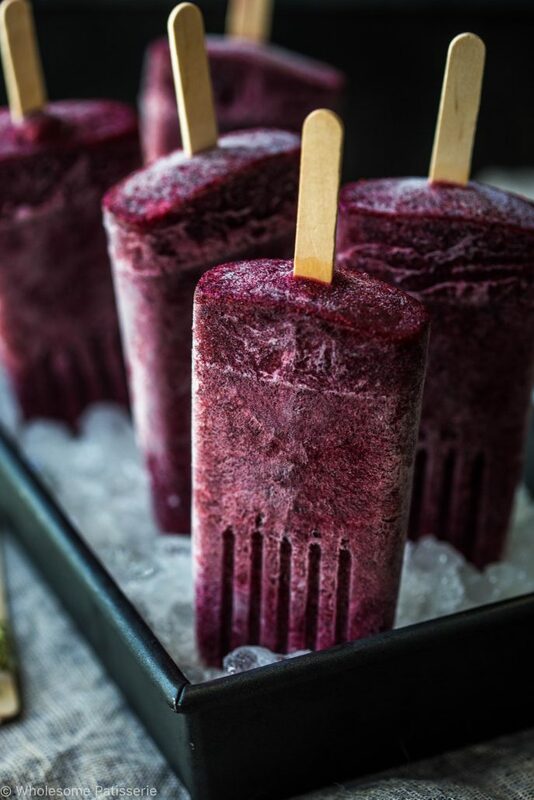 This time I made mixed berry popsicles and wait for it…. KOMBUCHA! Oh my goodness golly gosh in a creamy cheese sauce, I’m OBSESSED! with kombucha! Have I chatted about this before?? I think so, in my Kombucha Mojito Mocktail’s post. I’ve been drinking a bottle of kombucha every.single.night. HELP! I may not need help because… it’s healthy!! #winning #winning #winning! If you’re or were addicted to fizzy drinks and soda and lemonade and coke, I beg to you to toss those nasties out and grab yourself a bottle of kombucha, you will not be disappointed. It’s fizzy, tastes like sweet soda, fizzy, full of probitocs, fizzy, quenches your thirst and did I mention fizzy? Yeah I bet that’s getting a tad annoying isn’t it? But it is and it will be like you never gave up your soda. It tastes so good that it feels so bad but it’s actually good for you? Get out of town!! 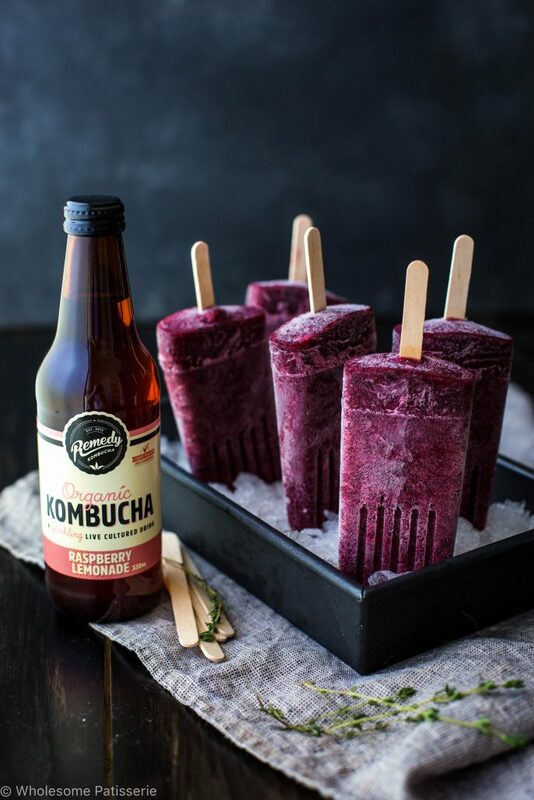 So now I have preached my undying love and passion for kombucha, let’s touch on these yummy refreshing berry filled popsicles. I decided to use strawberries and blueberries as the main fruit components, one cup of each. 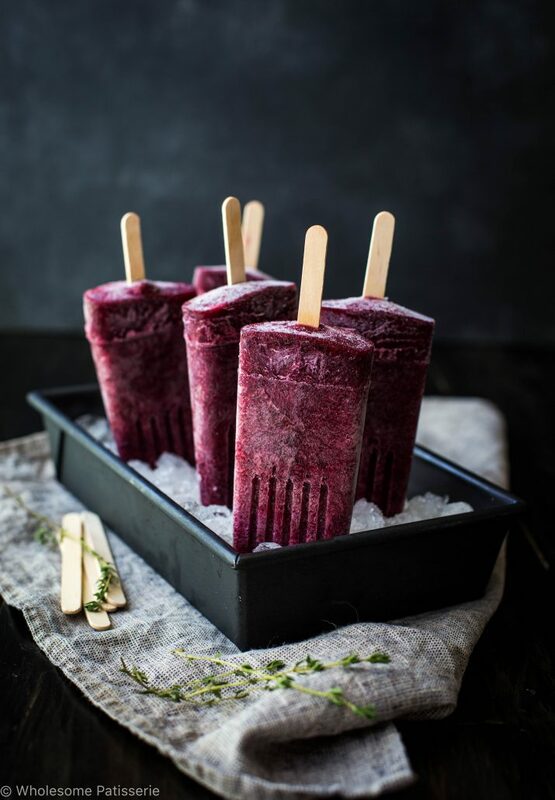 Fill it up with Remedy’s Raspberry Lemonade Kombucha and you got yourself the ultimate fizzy, berry, summer time popsicle! Am I conveying how good these are to you..? I hope so! Now you can replace the fruit I used with other berries, if you prefer, such as real raspberries or blackberries, yum!! Wait for a few hours or overnight until frozen and voila! 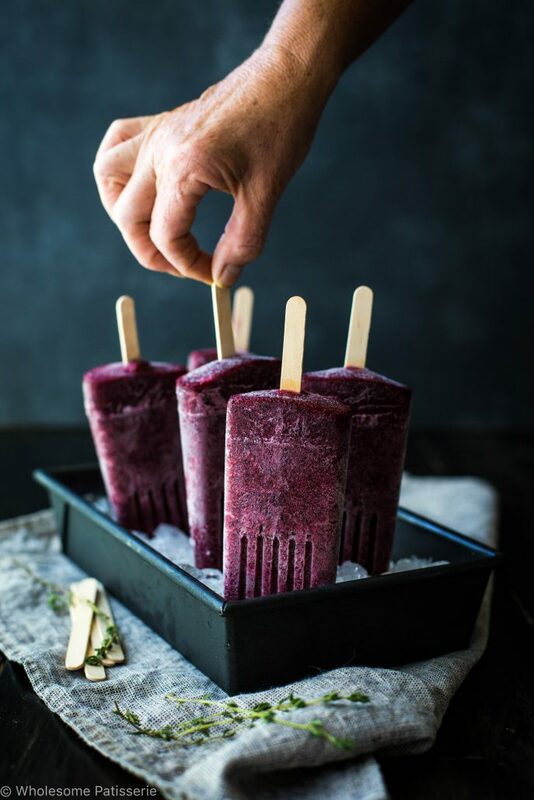 Homemade healthy and nutritious popsicles are now in your freezer for anytime you desire to have them, oh it’s just too good!! Since I’m on the subject of popsicles, what other fruity (or non fruity) popsicles are your favourites?? 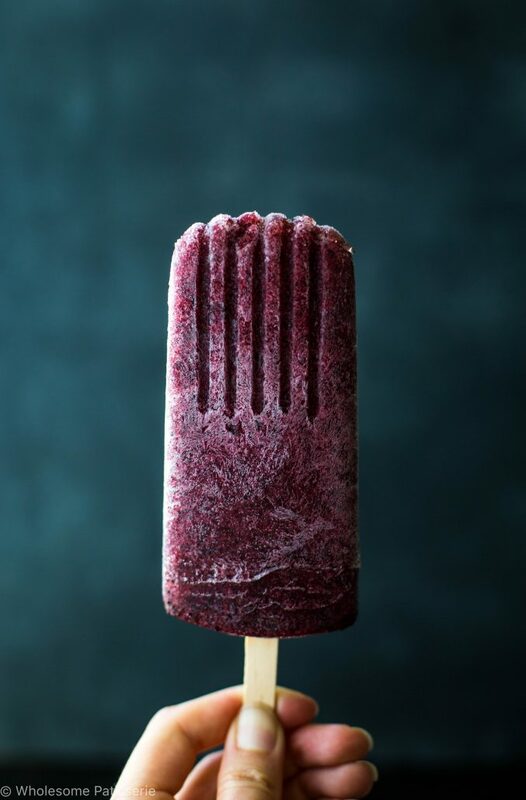 I’m slowly ticking off my list of popsicle flavours to try and I think next time it will be something light, minty and fresh or decadent and chocolatey (oo la la! ), the possibilities are seriously endless, I have to control my excitement, see how excited I get over food?? Do you do the same?! Place all ingredients into a high speed blender. Blend on high until smooth, adding more kombucha if mixture is too thick. Divide mixture evenly into a 6-hole popsicle mould. If your popsicle mould comes with bases with sticks that sit in place on the mould, inserted them now. 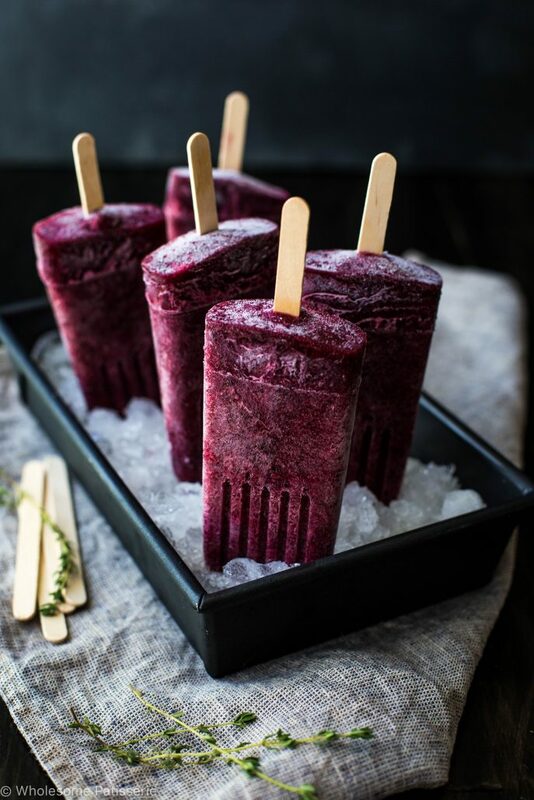 If using wooden popsicle sticks like I did, place the popsicle moulds into your freezer and freeze for 1 hour and 30 minutes, then insert your wooden popsicle sticks. Continue to freeze popsicles for a further 4-6 hours or ideally, overnight. To remove, sit each mould in a jug of warm water until the popsicles slowly release from the moulds, alternatively, place each one under running warm water until they release. Store popsicles in the freezer until all eaten up! This is the popsicle mold I use.